A judge has ruled that the Bureau of Land Management (BLM) violated the National Environmental Policy Act in last year’s roundup on the Checkerboard lands in Wyoming. However, claims that federal agency failed to follow the Wild Free-Roaming Horses and Burros Act and the Federal Land Policy and Management Act in the roundup were rejected by the judge. A total of 1263 wild horses were permanently removed during last fall’s operation from public and private lands in the Adobe Town, Salt Wells Creek and Great Divide Basin Herd Management Areas (HMAs). The three HMAs total about 2,427,220 acres, with 1,242,176 acres falling within the Checkerboard region – so-named because of its alternating public and private land parcels. On Tuesday, US District Court of Wyoming Chief Judge Nancy Freudenthal issued an order stating that the BLM violated the environmental act when it conducted the operation in the southwest of the state. The court remanded the violation back to the BLM to “remedy the deficiencies”. 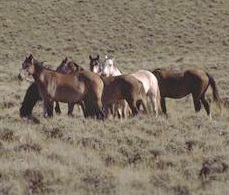 In this case, the American Wild Horse Preservation Campaign, The Cloud Foundation, Return to Freedom and photographers Carol Walker and Kimerlee Curyl contended that the BLM violated federal law by proceeding with the roundup in the absence of any environmental analysis and public participation, and by reducing the populations in the three HMAs below established appropriate management levels. The judge ruled in their favor on the environmental issue. The BLM authorized the roundup without analyzing any of the environmental consequences of a wild horse roundup of this magnitude, or reasonable alternatives to this action, as required by the environmental act. However, in the same decision, Judge Freudenthal denied claims that the BLM violated the Wild Free-Roaming Horses and Burros Act and the Federal Land Policy and Management Act. The operation removed all of the wild horses from the private and public Checkerboard lands within the three HMAs. The plaintiffs’ lawyer, William Eubanks, of the public interest environmental law firm Meyer Glitzenstein & Crystal, said: “We are disappointed that the court upheld BLM’s countertextural interpretation of the Wild and Free-Roaming Horses and Burros Act which allows the agency to disregard its own established wild horse minimum population levels. The ruling is the latest in the ongoing legal battle about the future of wild horses in the Wyoming Checkerboard, where more than half of the state’s remaining wild horse herds reside. In 2013, the BLM entered into an agreement with the Rock Springs Grazing Association in which the agency agreed to remove all the wild horses from association’s private lands on the Checkerboard and to consider, through the appropriate public process, zeroing out the wild horse populations in this area. The plaintiffs argued that the deal essentially turned the public lands over to ranchers who graze livestock. It’s a shame that the BLM seems to be helping the ranchers wipe out OUR American wild horses that are on OUR public lands.Hopefully the American public will wake up and get this atrocity stopped before OUR wild horses are extinct.